Scrap tires have been a feature on environmentalists blacklists for many years now. The tires have caused huge toxic fires, collect in landfills, get burnt for fuel and harbor pests. Scientists have come up with a new method of making synthetic rubber to combat this issue. When this material is discarded, it can be broken down into its chemical building blocks. It can then be reused to make new tires and other products. The findings of the study was reported at the 252nd National Meeting & Exposition of the American Chemical Society (ACS). More than 9000 presentations on a variety of science topics will be featured in the meeting. The basic idea behind this project was to take a byproduct of the petrochemical industry and turn some of it into recyclable value-added chemicals for use in tires and other applications. We want to make something that is good for the community and the environment. The Rubber Manufactures Association reports that nearly 270 million tires were discarded in 2013. Thousands get piled up in landfills. Due to their non-degradable nature, the tires can remain piled up for an indefinite period. 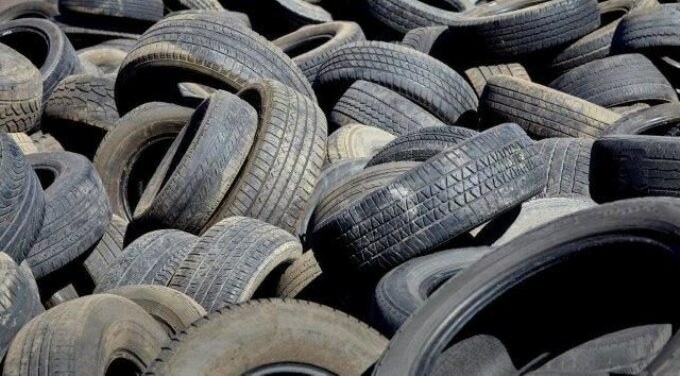 More than 50% of these tires are shredded and used alongside coal and other materials to generate fuel. The tire-derived fuel is used to power paper and pulp mills, cement kilns, and other similar plants. However, the emissions from this have been a cause for concern for environmentalists for it could increase the harmful pollutants in the atmosphere. Manufacturing tires using degradable materials could be one solution to combat the country’s scrap-tire glut. Since 2012, Hassan S. Bazzi, Ph.D., from the Texas A&M University campus in Qatar (TAMU-Qatar), and team have been working on this solution. The researchers started with cyclopentene, a basic molecule. Cyclopentene and cyclopentadiene, its precursor, are major components of the waste from petrochemical refining, and are of low value. They are a result of the steam-cracking operation C5 fraction, of petrochemical refining, that has hydrocarbons with five carbon atoms. Bazzi and team have been collaborating with colleagues from California Institute of Technology, and testing catalysts to attach cyclopentene molecules together so as to create polypentenamers, a component that is much like natural rubber. Contemporary synthetic-rubber makers employ butadiene as their base material. However, with the increase in the cost of butadiene, there is a competition for the base material. Tuba considered cyclopentene as a potential substitute for butadiene. Based on evaluations, the team found that it should be possible to polymerize and then degrade cyclopentene in mild reaction conditions, which involves minimal cost and energy use. We did theoretical studies to predict the feasibility of the synthesis and recyclability of polypentenamer-based tire additives using equilibrium ring opening metathesis polymerization. Then we did experimental studies and found that the concept works very well. The researchers used a transition-metal catalyst, ruthenium to polymerize cyclopentene at 0oC. The resulting material was then decomposed at 40oC to 50oC. These temperature are low in industry standards, and do not require high amounts of energy. Tthe researchers could recover 100% of their original material from numerous polypentenamer-based tire additives they created. New research that focuses on mixing tire materials such as fillers and metals to synthetic rubber are underway. The scientists are scaling up their lab tests to find out if their developments can be used practically by the industry. If the fundamental studies are very promising - which at this point, we believe they are - then our industry partner will come in to continue this project and bring the material to market. The research has been financially supported by the Qatar National Research Fund and the Qatar Foundation.